Happy new year. I wish you ever higher achievements in all your endeavors. 祝您歩步高升. As we look up, we can see interesting vistas. 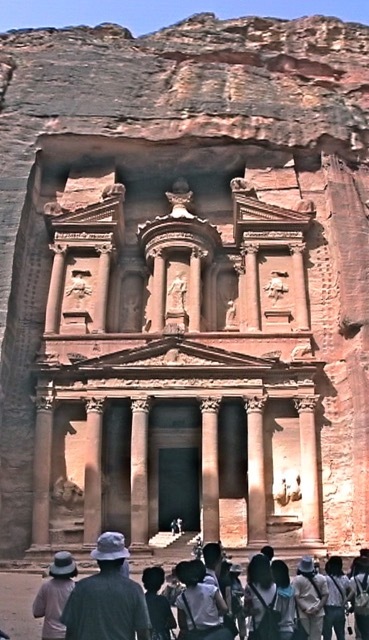 Years ago, Sally and I walked in a long narrow canyon in Petra, Jordan, until we turned a corner and came upon this ancient temple carved into a rock cliff. Sally was unprepared for this scene when she looked up. Her stunned expression said it all. 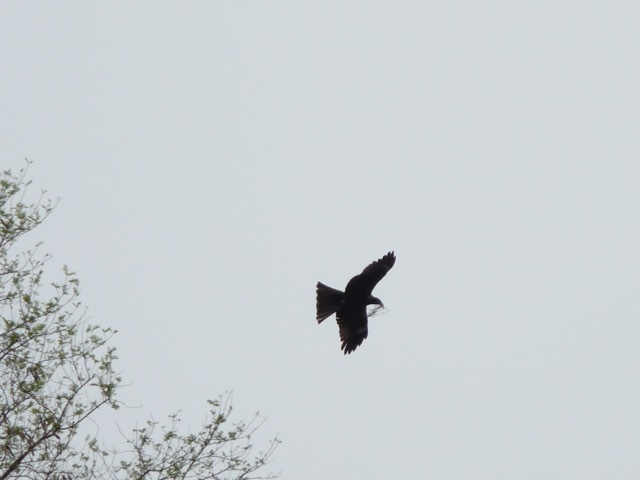 I looked up in Hong Kong and saw this crow carrying twigs for its nest. 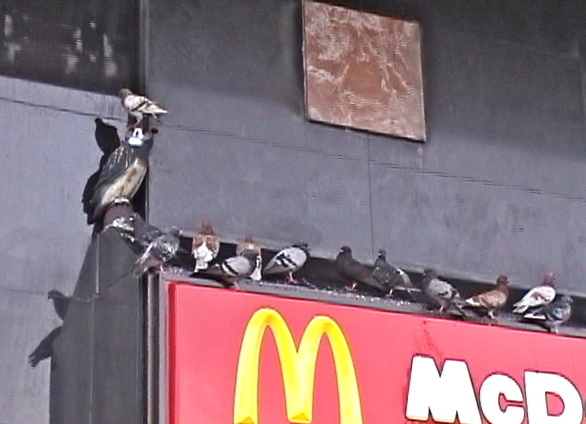 Pigeons ignored the owl statue installed to scare them off at this McDonald’s in Hong Kong. One bird showed its contempt by resting on the owl’s head. 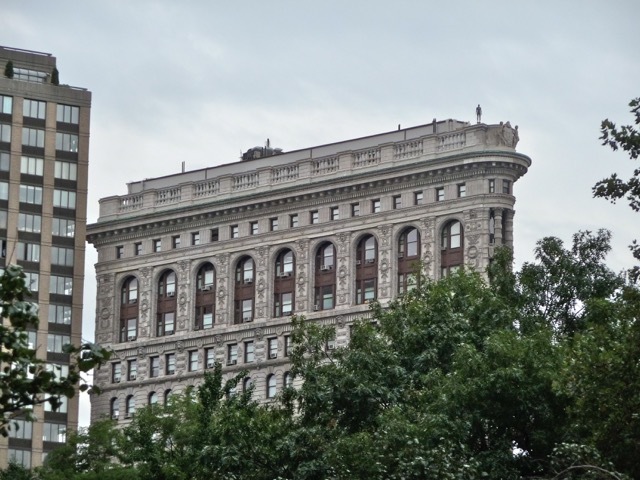 I saw this man standing on top of the Flatiron Building in New York City. 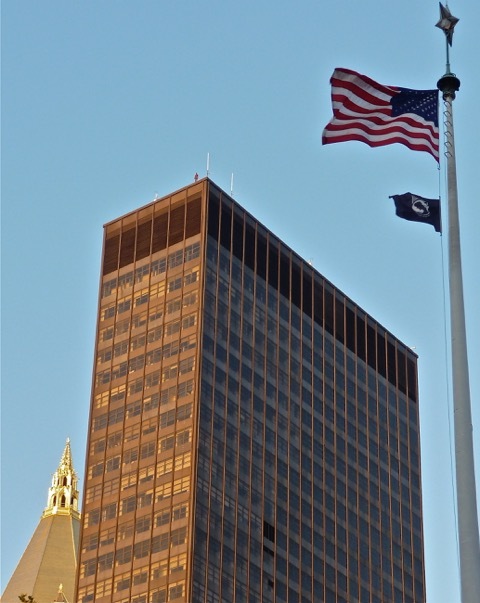 Another man stood on an even higher building. He looked ready to jump off the building. 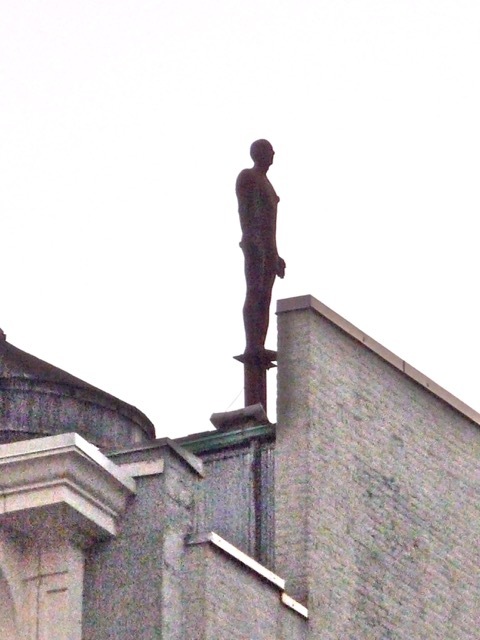 I found out later that an artist placed about 30 figures on rooftops in the Madison Square Park neighborhood. This passive figure can be seen standing on a pedestal. 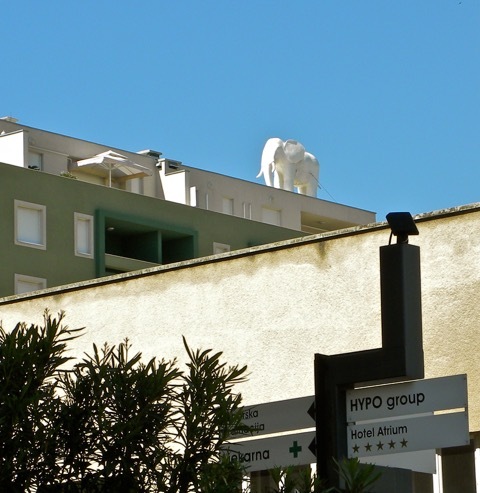 A white elephant stood on a roof in Split, Croatia. 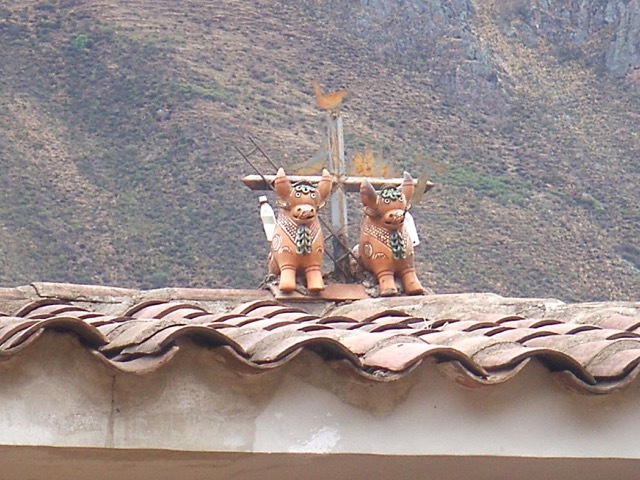 Many houses in Peru are decorated with ornaments to bring good luck, fertility and prosperity. This tradition dates from the Incas, and the Christian cross is a later adaptation. 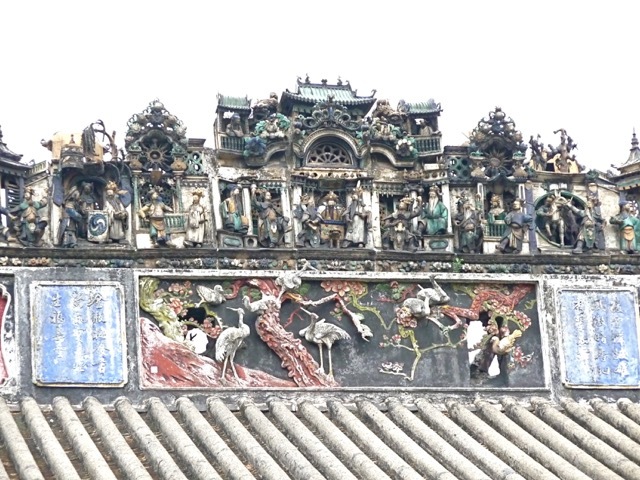 This ornate and intricate ceramic ornament decorates the roof ridge of the Chen (陳) family shrine in Guangzhou (廣州). 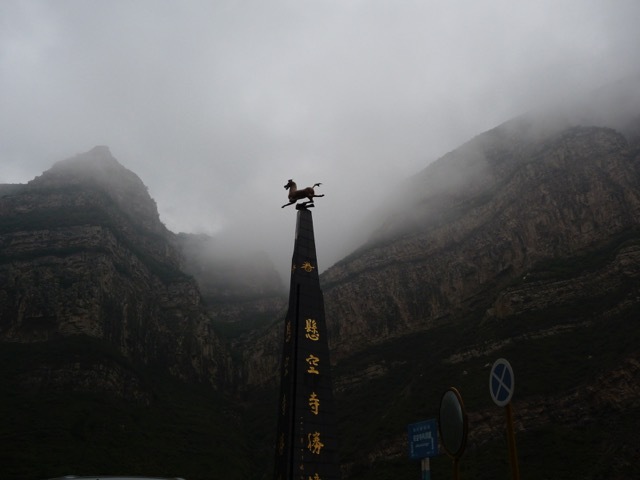 It shows a scene of success in officialdom and conveys good wishes for Chen descendants’ achievements. A small bronze sculpture from Han Dynasty (東漢) 2,000 years ago was unearthed and became a loved national treasure in China. It depicts a Central Asian horse galloping so fast it steps on a flying swallow. 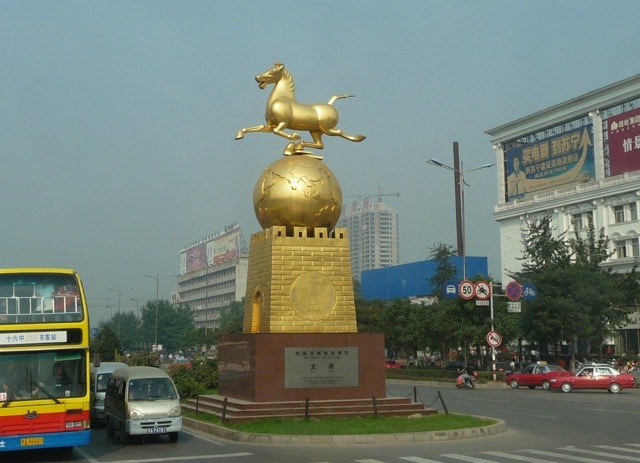 A large statue of the treasure is erected as a symbol of Taiyuan city (太原) in ShanXi province (山西). 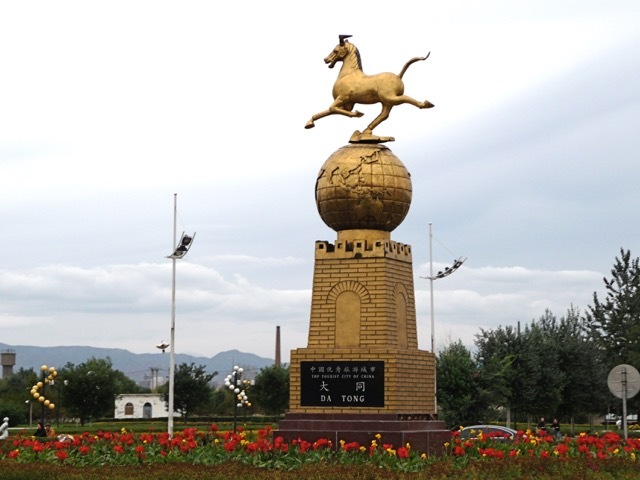 160 miles away in DaTong city (大同), an almost identical monument is erected as a symbol of that city. Who copied whom? 40 miles away, the galloping horse is erected again at the entrance to the Hanging Temple (懸空寺). Maybe it is a bit overused? 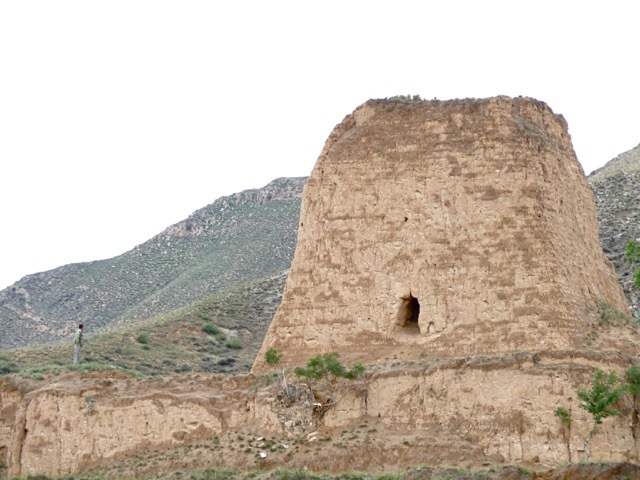 Many parts of the Great Wall was constructed with rammed earth. Surprisingly, it survived many hundreds of years in the arid climate. This is a solid sentry and signaling tower. 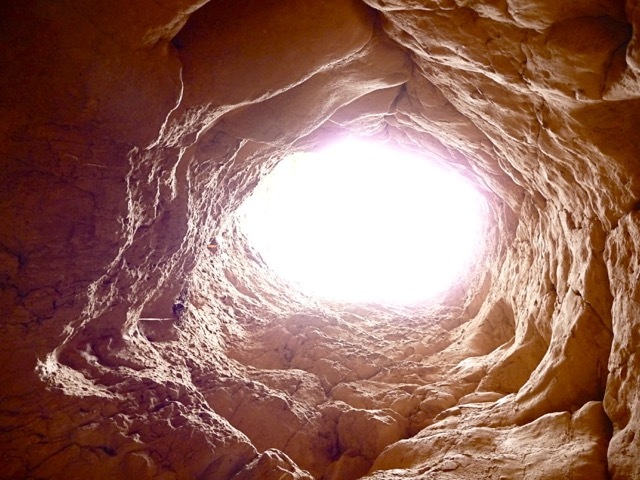 I climbed into the opening and looked up a vertical shaft. Sentries used to climb up this shaft to reach the top of the tower. Egypt’s pyramids are built with 2.3 million blocks of stone, each weighing 2.5 tons. 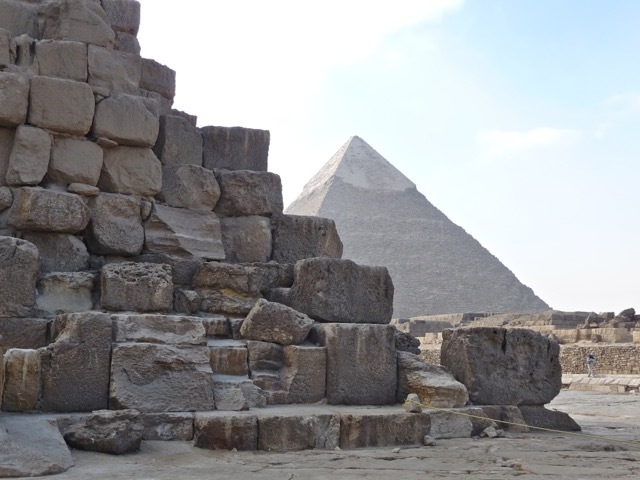 The pyramids used to be covered in polished limestones, but the cladding have been “harvested” for newer construction. A small fraction of the cladding stones are left at the apex where they are out of reach. 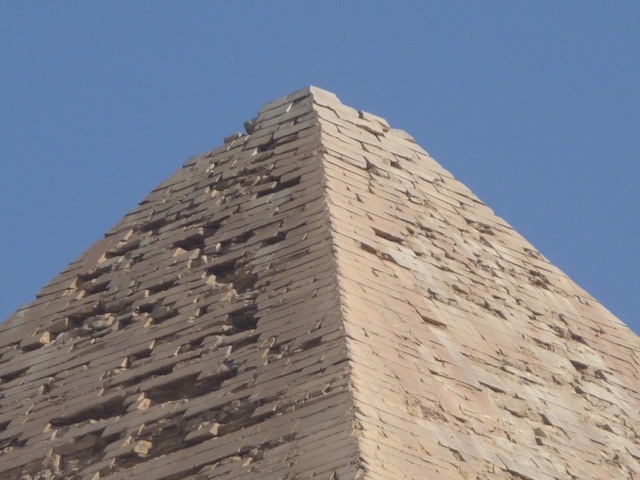 This close-up shows how precise the cladding limestones were placed on the pyramid. The pyramids must have shined brilliantly in the sun. 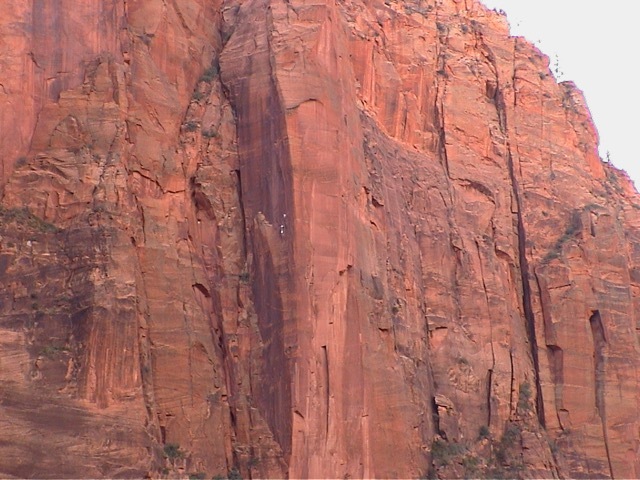 In Zion National Park, I looked up the vertical cliff and saw two people climbing the seemingly smooth rock face. They were at least 500 feet above the canyon floor. 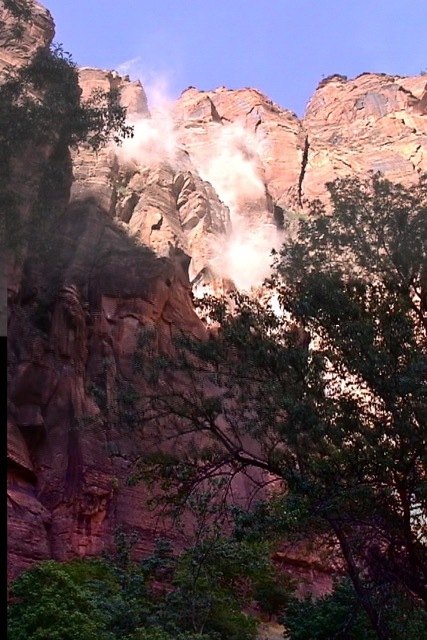 While walking in Zion Canyon, I heard rumbling and look up to catch a rock fall. This was a glimpse of the geological process in canyon formation. 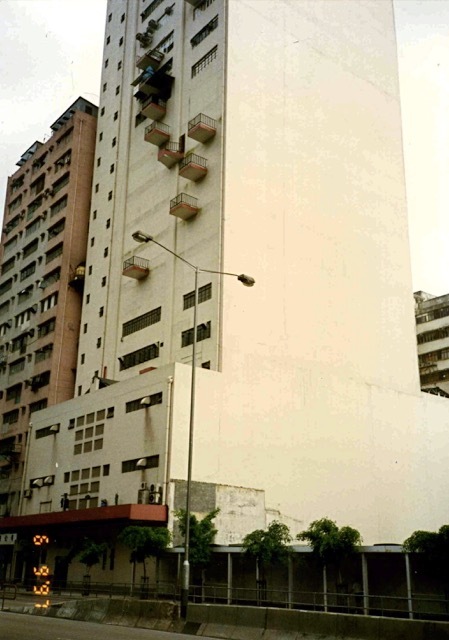 This warehouse building in Hong Kong featured several balconies. But only one was accessible by a door. In Sarajevo, Bosnia, I saw this iron door that opened to thin air. I wondered who would use it and for what purpose. 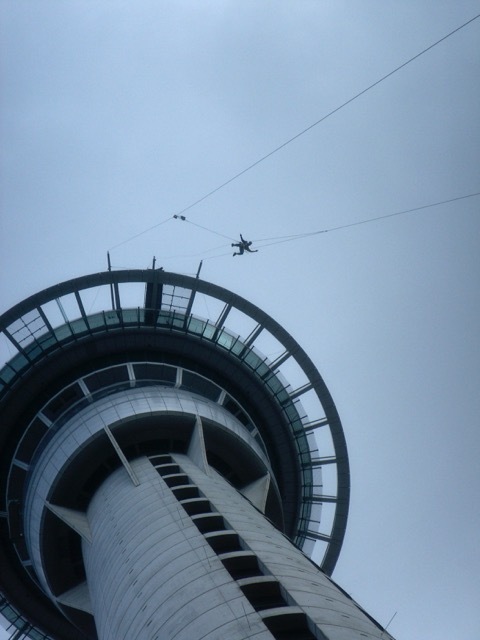 In Aukland, New Zealand, people would jump off the Sky Tower and fall 600 feet, stopped by a braking mechanism before hitting ground. I liked where I stood in this jumping episode. Looking up can be very rewarding. 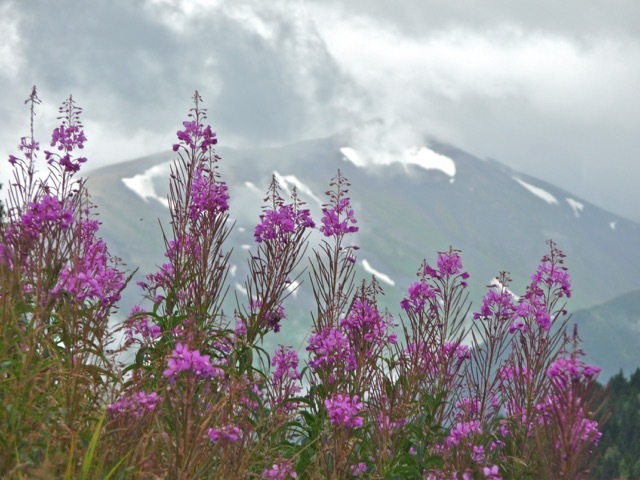 We loved Alaska’s fireweed in bloom with a high mountain as a backdrop. 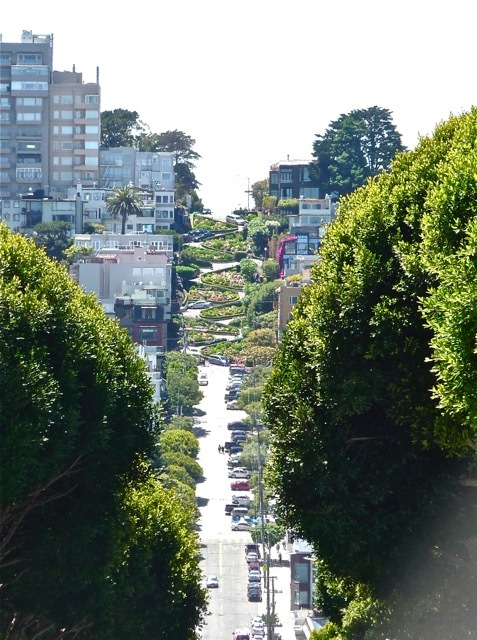 San Francisco’s Lombard Street, with its twisting road, is halfway to the stars. The colorfully tiled 16th Avenue Stairs in San Francisco is a local attraction. 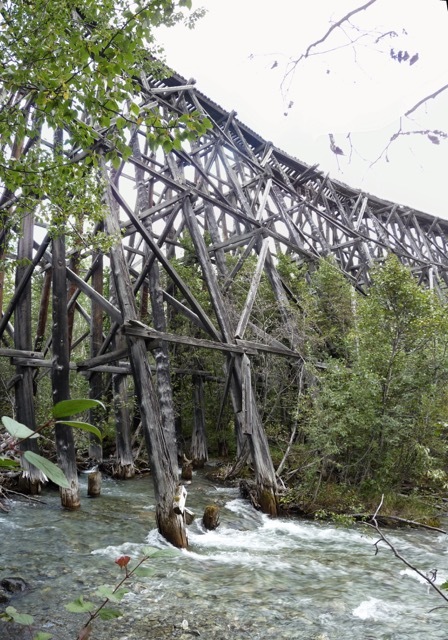 This abandoned railroad trestle in Alaska used to carry trains. This new concrete structure will support a super highway in China. While cruising the Three Gorges (三峽) on Yangtze River (長江) 20 years ago, I looked up and saw a new bridge being built high above the river. 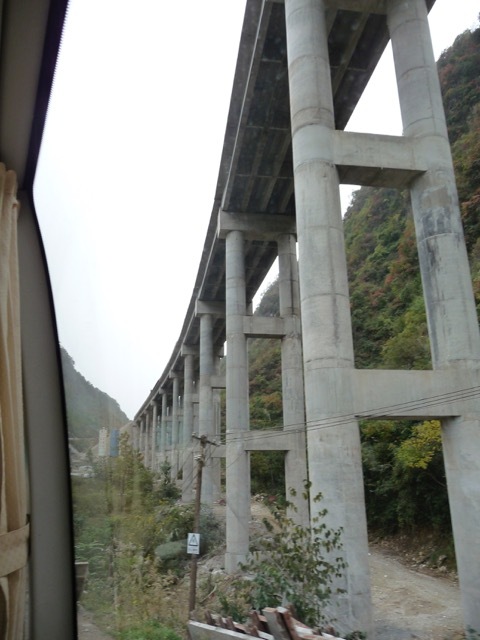 After the Three Gorges Dam (三峽大壩) was completed in 2009, water would be dammed up and rise up almost 600 feet to reach that bridge. 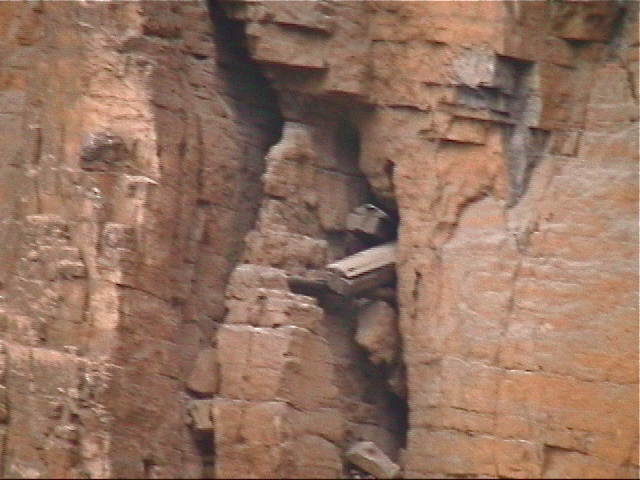 Above the Three Gorges water, I found a few of these hanging coffins wedged into cliff crevices. They were thousands of years old and left there by a long-perished culture. Ancient Egypt left many impressive relics. 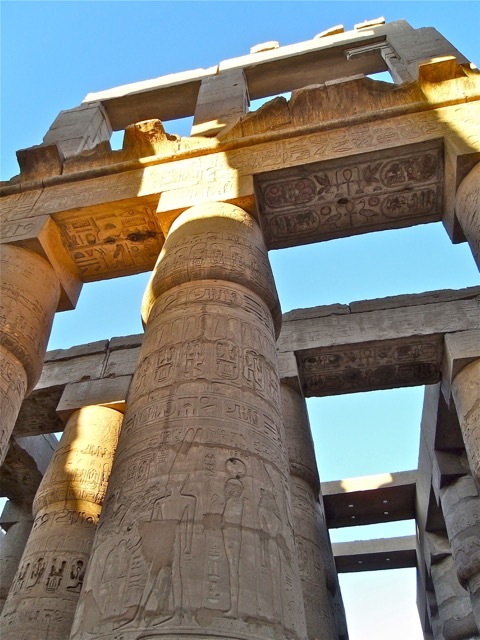 They recorded their many tales by carving hieroglyphics on every available surface, even the bottom of stone lintels. Ancient Romans were outstanding engineers. 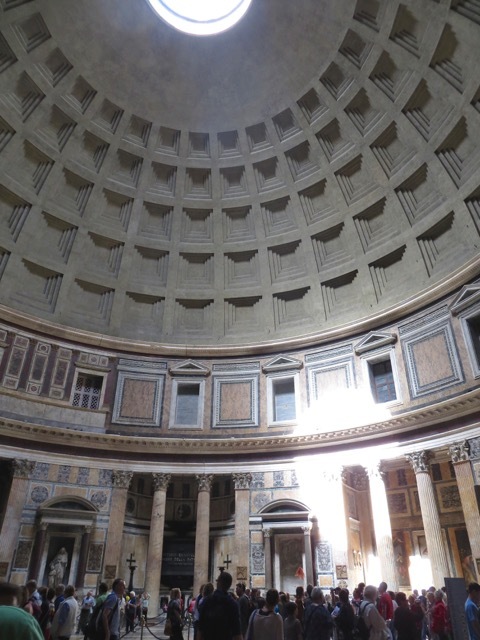 This 2,000 year old Pantheon in Rome has a poured concrete dome. Its peak has an opening to let in sun light. 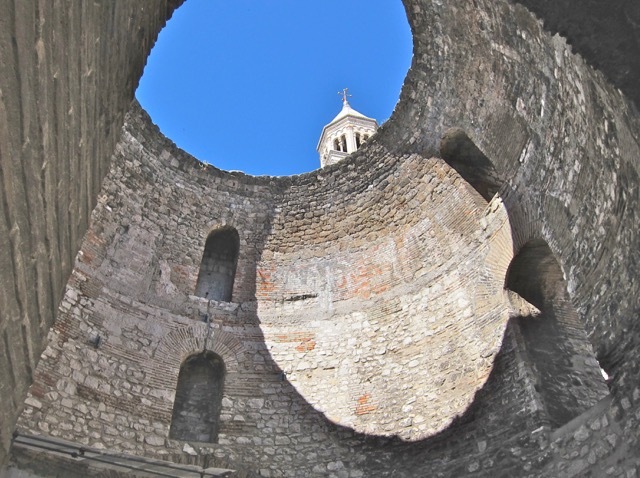 An old Roman palace in Split, Croatia, contained a domed hall. The dome collapsed and let in circular sun light. Looking up through a collapsed floor, the vaulted ceiling of a crusaders castle in Jordan demonstrates its ingenious design. To give defenders every advantage, this hole in the ceiling allowed defenders above shoot invaders who managed to get into the room. 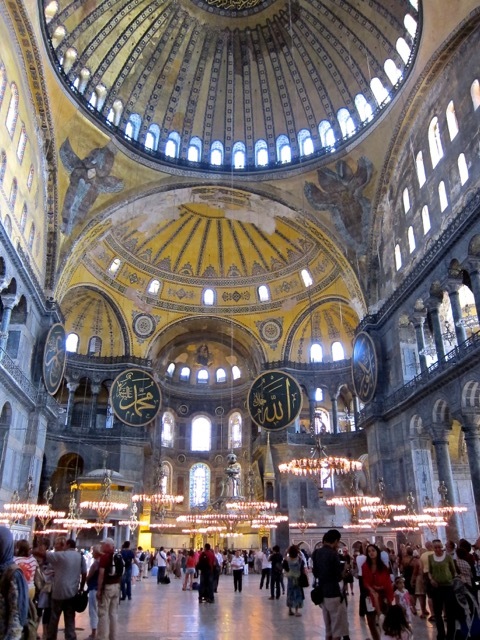 Hagia Sophia was built as a basilica 1,700 years ago in Byzantium, today’s Istanbul, Turkey. 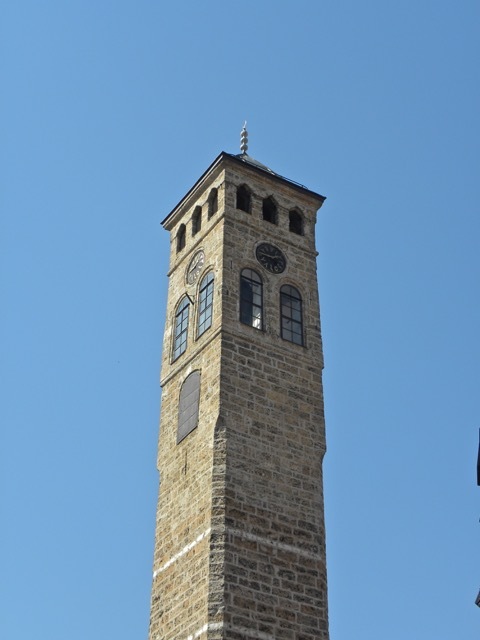 This church was turned into a mosque under the Ottoman Empire and it is a museum today. Its dome encloses an enormous space 182 feet high. It is truly phenomenal. 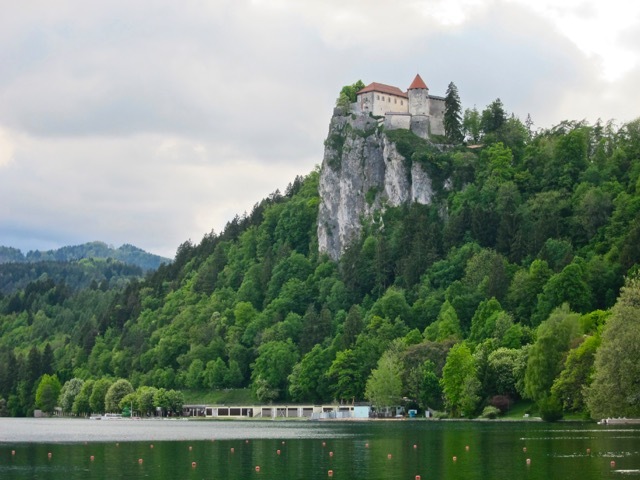 There is a sheer cliff above Lake Bled in Slovenia. 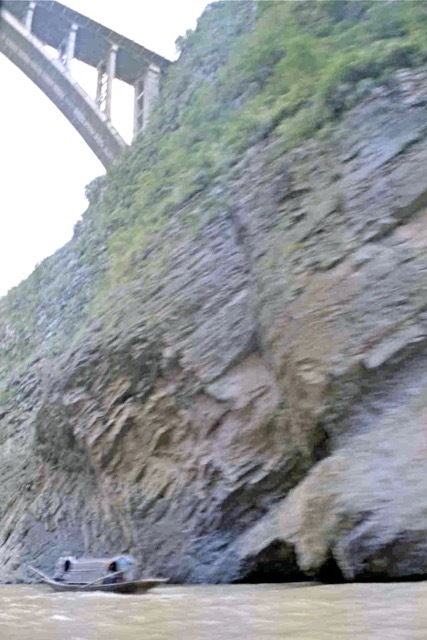 A small medieval castle was built on the edge of the cliff, 400 feet above the water. 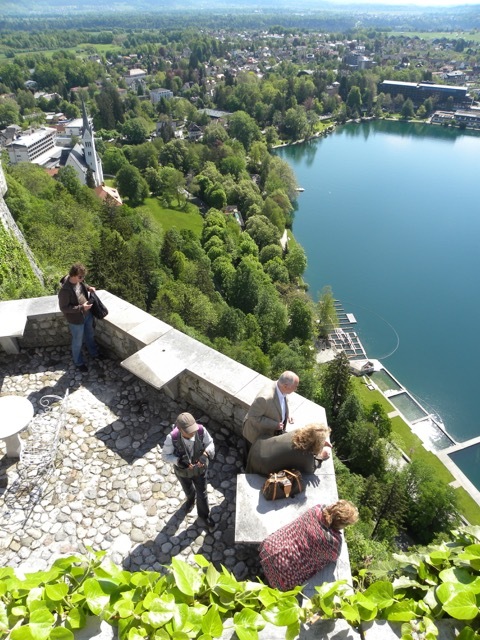 From the parapet of Bled Castle, leaning out and looking down can be gut wrenching. 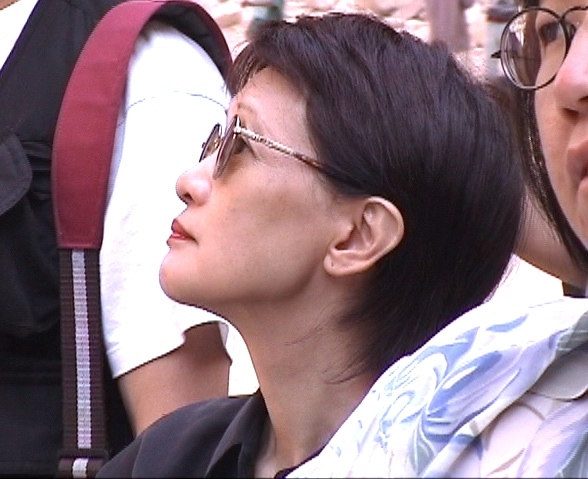 After looking up for so long, it relieves the stiff neck to look down for a change. Posted by Robert Wu on Friday, January 2, 2015, at 11:34 pm. Filed under Uncategorized. Follow any responses to this post with its comments RSS feed. You can post a comment or trackback from your blog.